In the 1860s Colonel Albert S. Evans, author of A La California: Sketches of Life in the Golden State, reported on a very, very interesting dispute between an Indian and a Spaniard in Pescadero. At the root of the never-ending argument: Who arrived first in Pescadero? Don Felipe Armas…..or……Don Salvador Mosquito. Which one? As with any disagreement, there are two sides, two versions–two people who may not like each other–and each one is highly convinced that the other one is wrong, wrong, wrong. I am a native Californian of Spanish parentage. I remember when King Kamehameha I put a call out for vaqueros to come to the Hawaiian Islands and kill off the wild cattle that were wreaking havoc. I was 35 years old when the King himself selected me. I am a surviving Mission Indian and I remember when the padres tried to convert the natives to Christianity. I rebelled and became a member of the great renegrade Indian Pomponio’s tribe. There were only 50 of us left when Pomponio set up headquarters in the redwoods east of Pescadero. From our secret mountain perch, Pomponio led us on raids of well stocked ranches nearby, and as far away as Santa Clara and San Jose. The fathers at Mission Santa Clara were furious because we stole food as well as their fine horses. They made a plan to destroy Pomponio. They captured all the female Indians, forcing Pomponio to risk his life by riding with his men into the mission to free the women. We all got away but were followed by the mission’s army into the mountains where there was a bloody fight that escalated into a slaughter leaving only me alive because I was too young to be killed. Alexander Moore built the first frame house in Pescadero in 1853. Six years earlier, Moore, who was then 27, and his pregnant bride, crossed the plains from Missouri to California in a wagon pulled by oxen. When the six month journey ended in 1847, the Moores first settled in Santa Cruz and became the parents of sons Eli and Bill. Not yet convinced that he had found the perfect spot to settle, Alexander Moore often scouted the unfenced coastline north of Santa Cruz on a mule. He was looking for possible shipping points and news of shipwrecks; salvaging both the ship and its cargo was an excellent source of income in those days. Two years later, about 1849, the Moores had found Pescadero to their liking, building the house with lumber hauled by oxen from Santa Cruz. He also helped build Pescadero’s first schoolhouse, hiring a teacher with his own money. By the 1890s Moore knew he had made the right decisions: he had been a county supervisor and was the owner of 700 acres. When in San Francisco, Alexander Moore boarded his horse at future Pescadero landowner Loren Coburn’s stable. 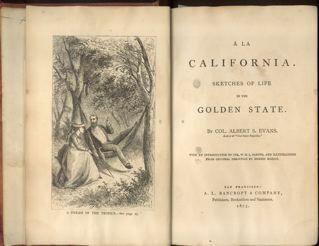 This entry was posted in A La California: Sketches of Life in the Golden State, Alexander Moore, Colonel Albert S. Evans, Pomponio. Bookmark the permalink.